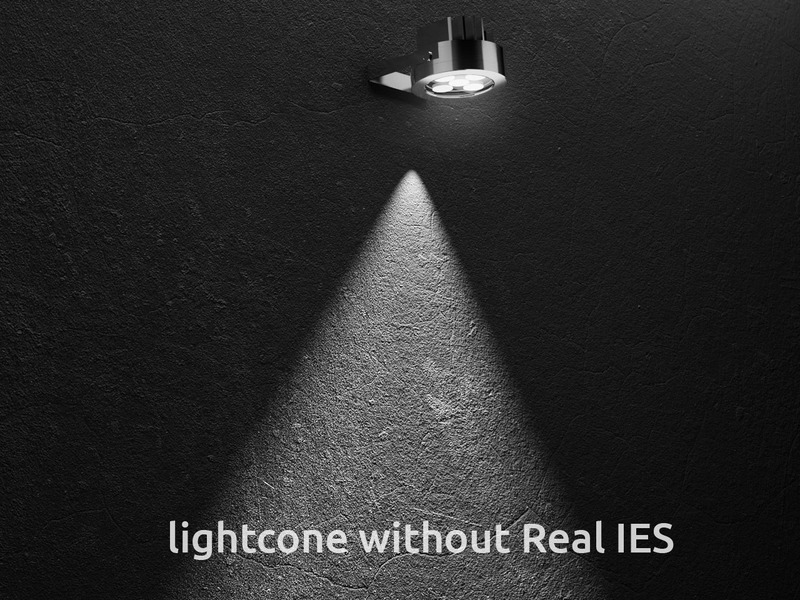 Since 2015, Real IES is the professional solution in photometric file creation. With this standalone software you can create your custom photometric file easily and in few seconds. Real IES generates files compatible with a wide range of 3D rendering softwares. Being CG artists ourselves, we developed Real IES keeping in mind how time-consuming is to find proper IES files for a 3D render. Immediate feedback, keyboard input, recommended maximum values. Light quality is guaranteed by photometric data visually generated according to your creative necessities. Extra grid overlay and additional information about your light. Real IES can generate a practically unlimited amount of random photometric files. Real Save your .ies file, edit it later, insert your name into the ‘Manufacturer” field. For theoretical data extraction and for interior design and photorealistic 3D rendering. 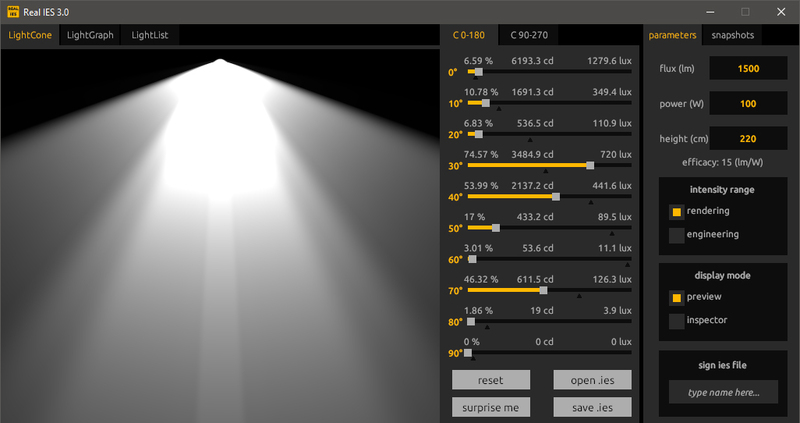 Input the height, luminous flux and power of your light or use default parameters. 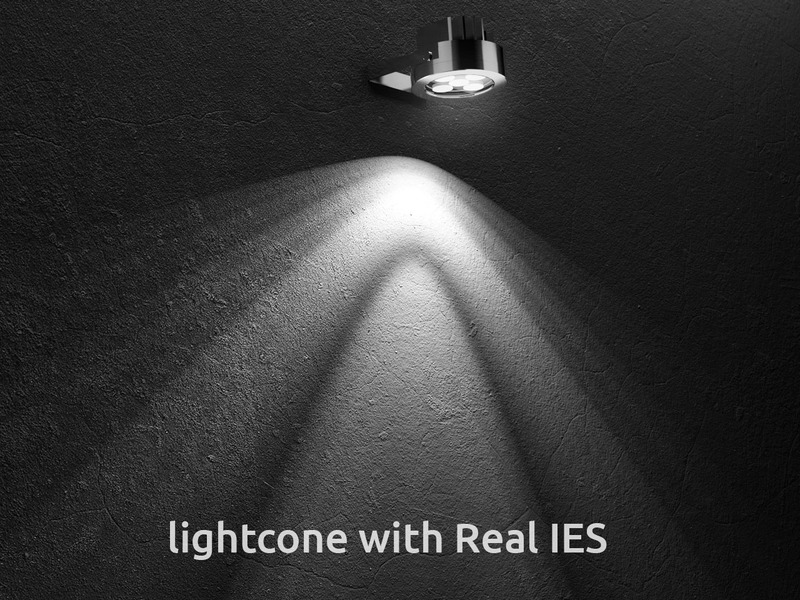 With Real IES 3 you can now create asymmetric light cones by adjusting separately the intensities for C0-180 and C90-270 planes. If you need a symmetric light instead, just leave the values in one of the tabs blank and the saved photometric file will be symmetric by default. 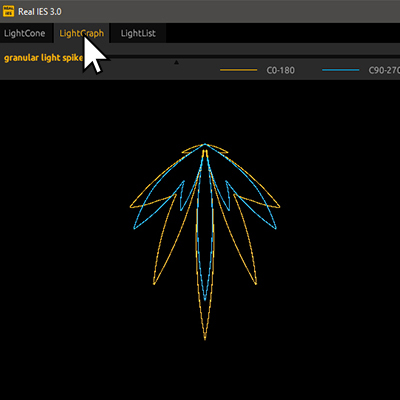 The LightGraph tab (new in Real IES 3) offers a proportional photometric polar diagram of the photometric light while being created. The yellow color of the line corresponds to C0-180 plane, while the blue one represents the C90-270 plane. 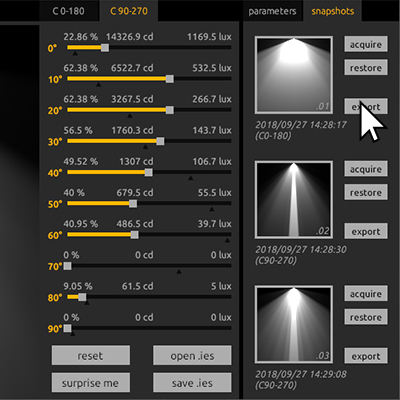 In the Snapshots tab you can store in temporary memory up to three different snapshots, capturing the light cone and the light parameters corresponding to it. Starting from Real IES 3 you can export your IES as a rasterized 32-bit .exr file. We developed our own licensing system that keeps care of your purchase. With one license you can use your copy of Real IES everywhere and activate it on one machine per calendar day. 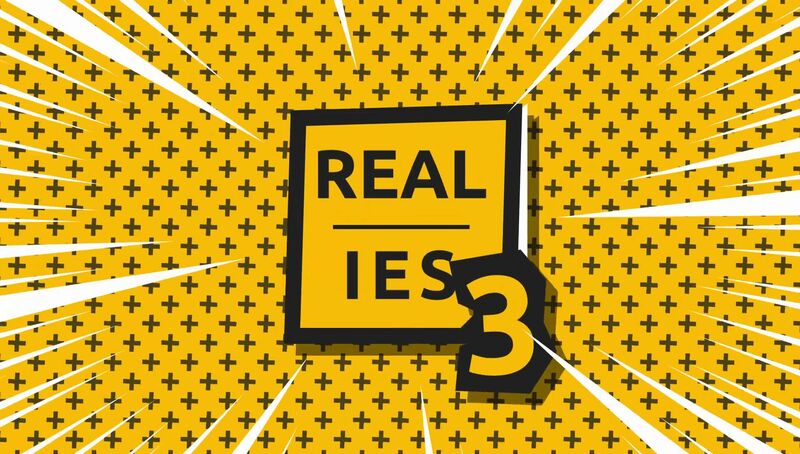 Those who own a copy for Real IES 2 are eligible to free upgrade to Real IES 3 and will get all the instructions via email used for the previous purchase. 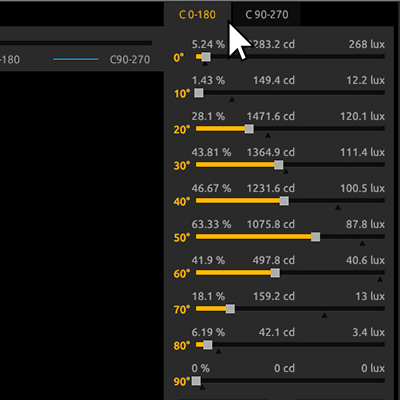 In the LightList tab (new in Real IES 3) you can see the exact intensity values for all the angles, both the ones that you have on the sliders and the intermediate ones, for C0-180 and C90-270 photometric planes. 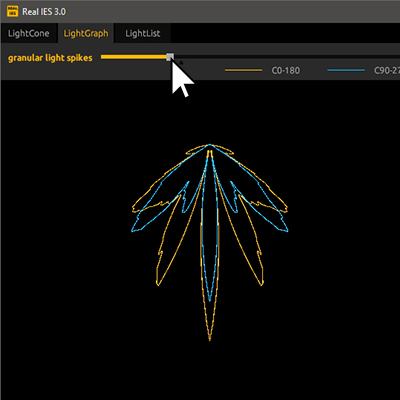 The LightSpikes slider (new in Real IES 3) on the top of the LightGraph tab, allows you to manipulate the intensity values of the angles “between the sliders”. This way you can create more artistic photometric lights with sharper borders within the light cone. 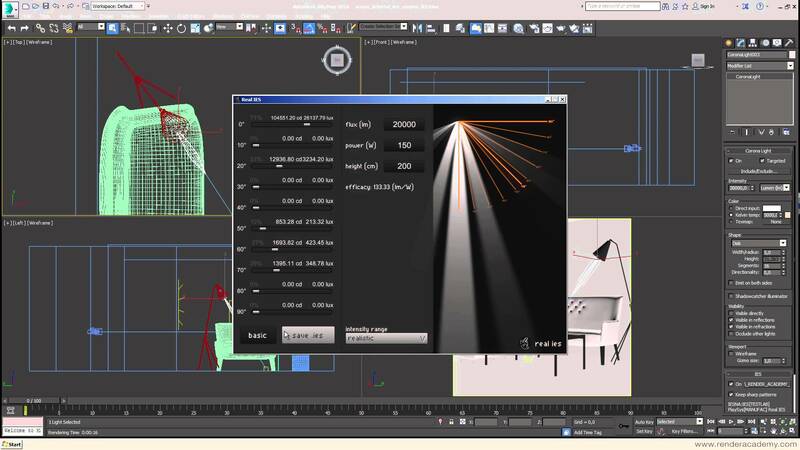 Using photometric .ies profiles in Autodesk 3ds Max scene to create a precise lighting solution. 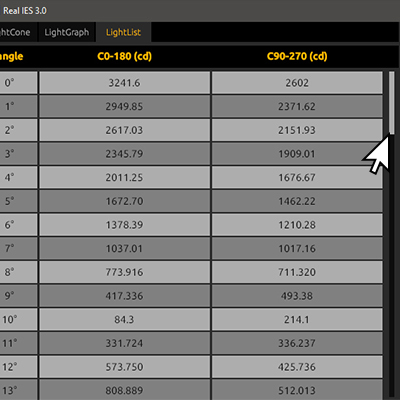 How to use photometric lights inside Maxwell Render, where you can also find .ies lights by Real IES in the installer. 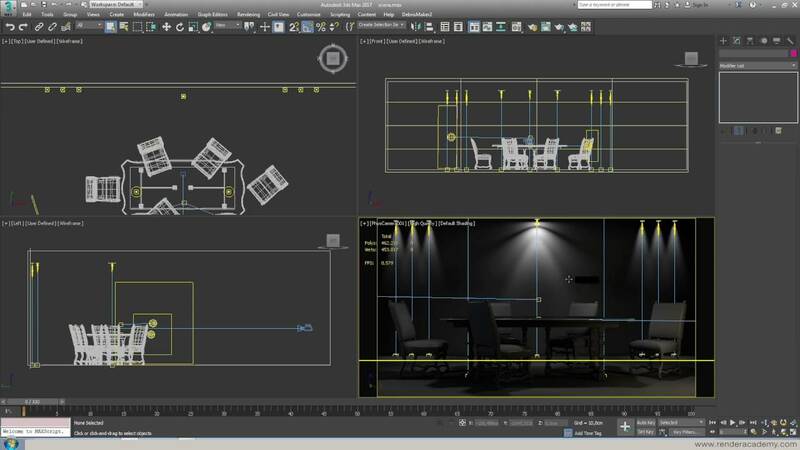 How to use photometric lights with Corona Renderer that includes .ies files by Real IES in its installer. free updates and single time payment. Did we mention that buying your copy of Real IES grants you free upgrades and one-time payment? Real IES has no subscription and no constraint with the current version you buy. Pay now and get free updates. Forever. Need an HDR light instead? Real HDR is the easiest way to create high quality and high-resolution HDR images to be used as skyboxes in your 3D productions. 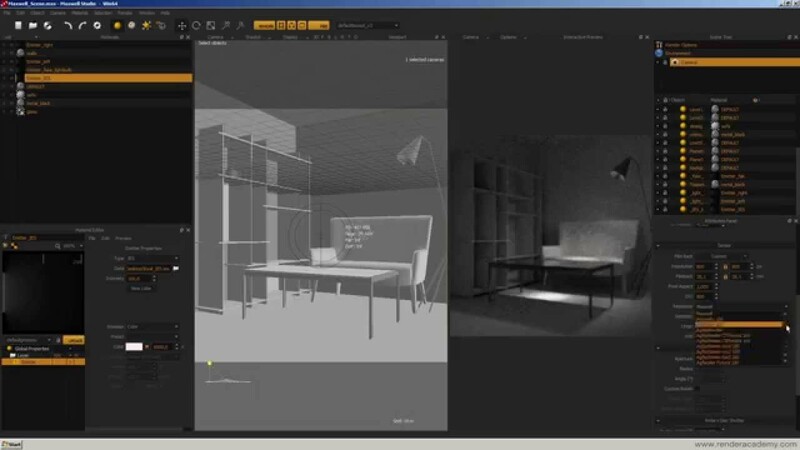 Download the program, build your lighting scenario and import it in your favorite 3D software. our e-learning platform 100% focused on 3D education. Want to learn more about CGI, rendering, animation, texturing, lighting, post-production, virtual reality or other 3D related subjects? Render Academy is the right place for you. 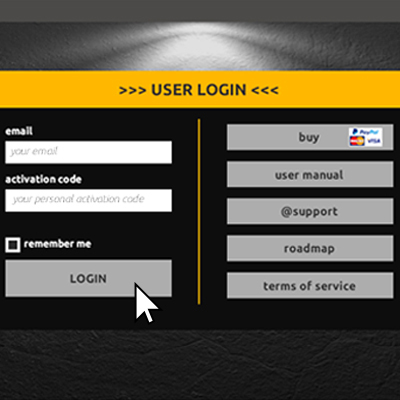 Download our e-learning platform and start learning right now.